We often find ourselves discussing, often in rooms with other poets, often in schoolish settings, what it means to say that something is poetic. It is for the most part clear enough in reference to other literature, suggesting a higher-than-average degree of patterning the sonic and visual aspects of language. Or to put matters in another register, “poetic” suggests that some relatively larger portion of the communication is borne by things other than denotation and connotation, by measures to be found beyond the dictionary and thesaurus. But when something beyond language is identified as poetic, problems arise.One can easily imagine some people agreeing over dinner that a particular piece of furniture was poetic, but when pressed, producing five or eleven different explanations. In the last century, poetry did perversely well in coming to stand for something like an acme of aesthetic achievement, indeed becoming a kind of synecdoche for imaginative capacity itself — perversely in that it is able to mean so much precisely by meaning so little, or at least lacking a specific self-recognition. Fredric Jameson offers a rather unsympathetic formulation of this inverted development as part of modernist ideology. In the following era, whether we use the term "postmodernism" or not, poetry has been largely evicted from the catbird seat, while still doggily panting after other modes; one need only consider the familiar blather about poetry trailing X number of years behind painting or sculpture or what have you, as if the only difference among these practices was that certain external ideas that simply exist floating freely in the ether had been spotted sooner elsewhere, and now it was just a matter of poetry pulling the wool from its eyes and cotton from its ears. We might suggest that this ambiguous delusion about the comparability of poetry and the studio arts has a half-submerged class character. One need only consider the well-known phenomenon (we have felt it ourselves) of poet's jealousy when the painter comes strolling out of his or her studio at end of day, clothes smudged and streaked with lovely and serious-looking oils, runoff turpentine staining sturdy shoes. This envious sense that painters, e.g., go to work and have work clothes, that they actually make things, that they work with their hands — well, this is not terribly challenging to decode. Surely this is the reason that Jameson's epochal assessment of postmodernism begins with a historically older image, able to stand for the lost era of manual labor: a painting of work boots. Grounded in the materiality of real production, painting et al. are also able to leap into the future via transforming their production process. But if this is in any sense true, such an analogy must simultaneously disclose the absurdity of poetry haltingly trying to reproduce fine art's dematerialization of the art object; it is precisely fine art's parallels to commodity production that gives the refusal to produce a political charge. These are merely preliminary thoughts toward approaching the question of "the poetic" in an art that is purely physical, activity without direct product. What would it mean to say that a dance is poetic? The occasion for this question is subjective: an encounter with a specific dance or two as the most astonishing experience of art in the last few years. Turf Feinz is a collective from Oakland and environs. They practice a dance style known as turfing, which is also a way of understanding style itself according to an intense localism — an assertion that stylistic distinctions belong not just to a city but to a neighborhood, to a few blocks. Turfing is in turn associated with hyphy, a hip-hop phenomenon largely of the Bay Area that simmered during the nineties and emerged nationally around 2006-2007; it is the soundtrack of choice for turfing shows, sharing with the dance style an intense localism, as if its language were landscape. As the immortal E-40 puts it, in a turf-laden video, "I'm from the Bay where we hyphy and go dumb / from the soil where them rappers be getting they lingo from." E-40 is not himself from Oakland but from Vallejo, a few towns over. It is not the association with hyphy, exactly, that makes Turf Feinz poetic; in the first instance, it is the intensely elegiac character of the dances. This is true in the most literal sense: the major pieces (recorded and tracked by YAK Films) are dedicated to the dead. The first Turf Feinz' piece to find a global audience is frequently known as "Dancing in the Rain," from 2009; its proper name is "RIP RichD." 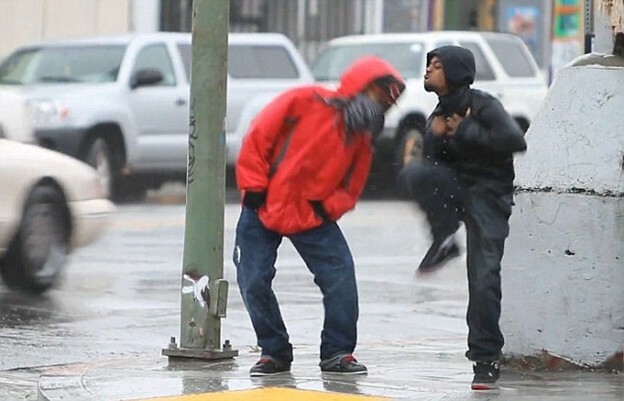 It was recorded on a rainy streetcorner the day after the death of dancer Dreal's half-brother in a car accident. It remains incomparable. It comprises an astonishingly inventive set of passages, building from a single dancer toward an improvised quartet, the dancers betraying considerable formal training, some ballet behind the classic "Oakland boogaloo" from whence turf dancing springs. The main feel is that of gliding, its intensity amplified by the slick surfaces. On the corner of 90th and Macarthur, the moves feel — despite the remarkable technique — perhaps a bit tossed off, casual. But that's not it. The dance is somewhere between machinic and all-too-human, but it is insistently expressionless. The first dancer is masked up. As others join, it becomes clear that the inexpressive faces are part of the performance: all of the embodied activity with none of the exuberance such motion would ordinarily imply. The dance is soulful, whatever that means, but without spirit. Even as the four members wheel and pivot through space, the dance is flat, or flattened. It is in this way that it becomes fully elegiac. It is about what's missing, or a missing dimension. It is also about the police. The establishing shot, indeed, is a conversation between one of the crew and a cop in a roller, which must depart before the dance can begin. This will foreshadow Turf Feinz' other best-known dances: "RIP 211" and "RIP Oscar Grant." Kenneth "211" Ross was shot to death by officers in December of 2009; Oscar Grant on January 1st of that year by transit cops, though such differences are specious. All cops are bastards, after all, and killing African-American kids is pretty much their thing. This is a broader context of elegy as it exists in Oakland; the missing dimension is always the life of kids of color. At the end of "RIP 211," under heavy dubstep (a remix of Nero's "This Way"), the crew gathers against the wall of a squat. An AC Transit bus passes across the frame like a cinematic wipe made from the material of the city. When it's gone, so are they. Accompanied by audio collage of news reports and a minor-key piano, the crew one by one offers isolated performances at the site of the killing: patient, slow (and sometimes filmed in slow motion), beautiful. Again they remain expressionless. Just before the three minute mark, one of them slides up and down the platform, at moments almost frictionless and yet absolutely stuck to the earth. There is no taking flight in turfing, no transcendence, no symbolic emancipation or escape. There is only this world, where the bodies are until erased. At 3:04 the lateral motion is suddenly interrupted by an awkward, astonishing pirouette against his angular momentum, pivoting and then improbably pausing on pointe, just one foot, body perfectly arched. The world is suspended. He tilts backward and toward the ground, his backpack pulling on him. Cata•strophe, a downward turn. It seems he'll fall, that everything will come down. A BART train enters the picture and obscures whatever happens next. There is the sound of a gunshot. When the train passes, another dancer is mid-move. Things resume. If the social distance between poetry and painting concerns ideologies of production, what then of dance — of allegories of physical labor without a product? It would be easy enough to go to the late modern ideas about performance and post-medium arts, the dialectically doomed attempts to outmaneuver commodification. But this seems inapposite to say the least, and moreover shifts us unremarked to the consumption side, where commodities are exchanged and exhausted. This won't do, finally. The dance is production side, if via its absence. It is scored and choreographed to the rhythm of machines but without their presence, embodying the blank technicity of labor without any production to speak of — but still unable to efface entirely its moments of human invention, the swerve. It is a dance of aimlessness and streetcorner, invention for its own sake, amazing and defeated: a dance, and here we perhaps arrive at the far horizon of the argument, not of surplus goods but surplus populations, excluded from the economy if not from the violence of the state. A post-production poetics.